East Ironbound is a Coastal Light, built to guide coastal shipping and fishing boats along the South Shore. It marks the entrance to Mahone Bay, a popular cruising destination. East Ironbound Island wharf and cove, 2004, with the lighttower appearing above the trees. The white-painted rocks help boats pick out the breakwater when visibility is poor. The first lighthouse, built in 1867, was a simple square wooden building located at the south-east end of the island, with two lights, one twenty-five feet above the other. It was destroyed by lightning on January 3, 1870. 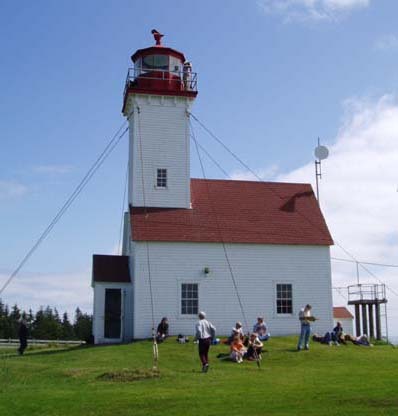 The second and current lighthouse was built in 1870 and is a square wooden tower with an attached dwelling. It is sited on the highest point of the Island, with an the extra-high tower of 14.02 meters (46 feet). This is one of the last surviving lighthouses in Nova Scotia with an attached keeper's dwelling, a design greatly favoured by the newly created Canadian lighthouse service after Confederation in 1867. The standard Department of Marine 1870 design was modified for this island by an extra-high tower because the adjacent landowner did not want to cut down his trees. This fifth-oldest surviving lighthouse in Nova Scotia marked an extension of the coastal lighthouse network along Nova Scotia's south shore to guide shipping between the major landfall lights of Sambro and Cape Sable. The lighthouse was the location of an early and unsuccessful experiment in automation. In 1928 the keeper was replaced by an automated acetylene lantern. The keeper was returned in 1930. 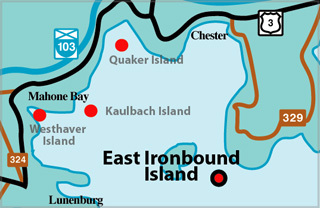 Most of East Ironbound Island is privately now privately owned. 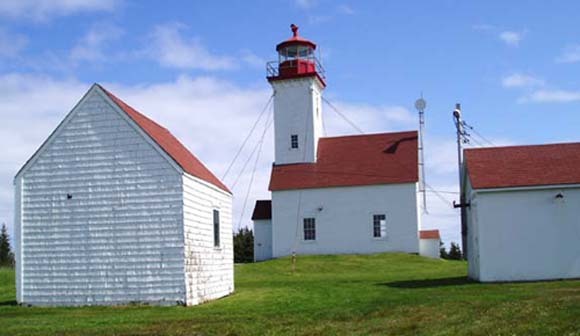 This lightstation is intact, complete with out- buildings, and is one of the best kept in the province. The island has important literary association with the novel Rockbound by Frank Parker Day. His fictional depiction of island life was inspired by his stay on East Ironbound. The book was controversial when published in 1928 but it has remained in print and won the CBC "Canada Reads Award" in 2005. Light Height: 146ft feet above water level.